October 1, 2017 is a date that likely does not stick out in the minds of most individuals until two words are added: Las Vegas. On October 1, 2017, Stephen Craig Paddock opened fire on a country music concert killing fifty-nine people and injuring countless others. While mass shootings have become increasingly common and Americans have become increasingly desensitized to them, Las Vegas was different. Not only was Las Vegas the deadliest mass shooting in modern American history, but was aided by a device called a bump stock. In determining whether bump stocks are illegal under current laws, three main questions arise: what are the current laws that regulate machine guns, what is a machine gun, and does a bump stock create a machine gun? The main federal law governing fully automatic weapons is the National Firearms Act (NFA) first enacted in 1936. The NFA was subsequently amended in 1968 by the Gun Control Act (GCA) and in 1986 by the Firearm Owners Protection Act (FOPA). 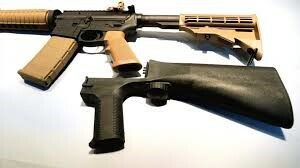 Important for the discussion of bump stocks is a provision in the FOPA that effectively froze the number of legally ownable and transferable machine guns to those registered prior to the effective date of the provision–May 19, 1986. Thus, while the FOPA did not completely illegalize all machine guns, only those manufactured and registered prior to May 1986 can be legally owned. So, if a currently legal semi-automatic rifle is transformed into a machine gun after May 1986, that firearm is illegal. Because it is illegal to manufacture or own a machine gun manufactured after May 1986, the next major question arising is what constitutes a machine gun? Both the NFA and Title 27 of the Code of Federal Regulations define a machine gun as ‘‘any weapon which shoots, is designed to shoot, or can be readily restored to shoot, automatically more than one shot … by a single function of the trigger.’’ Thus any weapon that was designed or can be made to shoot more than one round per pull of the trigger constitutes a machine gun under federal law. The federal definition of a machine guns lends assistance in determining the third question of whether a bump stock creates an illegal machine gun. Based upon the federal definition of a machine gun and the functional effect of a bump stock, there is a strong case that a bump stock transforms an otherwise legal semi-automatic rifle into an illegal machine gun by allowing the gun to fire more than one round per pull of the trigger. Under this argument and in response to the Las Vegas shooting, President Trump vowed to ban bump stocks and on February 20, 2018 issued a memorandum instructing his Attorney General to propose a rule to ban all devices that turn semi-automatic guns into machine guns––including bump stocks. In response on December 18, 2018 acting Attorney General Matt Whitaker announced a proposed amendment to the regulatory definition of a machine gun to include bump stocks or “devices that allow a semi-automatic firearm to shoot more than one shot with a single pull of the trigger by harnessing the recoil energy of the semi-automatic firearm to which it is affixed so that the trigger resets and continues firing without additional physical manipulation of the trigger by the shooter.” As a result, bump stocks are now subject to the prohibitions of the NFA and the FOPA and are effectively banned. Therefore, as of now, bump stocks will be effectively banned when the proposed rule become final on March 26, 2019. Gun rights group will undoubtedly challenge the constitutionality of the proposed rule and the issue will likely be litigated for many years to come, potentially until the Supreme Court weighs in. The public and gun owners alike will have to wait and see what the future holds for bump stocks, but as for now they are likely to remain banned following the rules enactment. Andrew Blankstein, Pete Williams, Rachel Elbaum, and Elizabeth Chuck, Las Vegas Shooting: 59 Killed and More Than 500 Hurt Near Mandalay Bay, NBC News (Oct. 2, 2017), https://www.nbcnews.com/storyline/las-vegas-shooting/las-vegas-police-investigating-shooting-mandalay-bay-n80646. Martin Kaste, The Politics of Bump Stocks, 1 Year After Las Vegas Shooting, NPR (Sep. 26, 2018), https://www.npr.org/2018/09/26/650454299/the-politics-of-bump-stocks-one-year-after-las-vegas-shooting. Sean Davis, Here Are The Actual Federal Laws Regulating Machine Guns In The U.S., the Federalist (Oct. 2, 2017), http://thefederalist.com/2017/10/02/actual-federal-laws-regulating-machine-guns-u-s/. Bump-Stock-Type Devices, 83 Fed. Reg. 246 (December 26, 2018). The section of the Federal Regulations containing the Alcohol, Tobacco, and Firearms regulations. See 26 U.S.C. § 5845(b) (2018); 27 C.F.R. § 447.11 (2018). Department of Justice Announces Bump-Stock-Type Devices Final Rule (Dec. 18, 2018), https://www.justice.gov/opa/pr/department-justice-announces-bump-stock-type-devices-final-rule. Next Can Drug Rehabilitation Weigh in Sentencing?